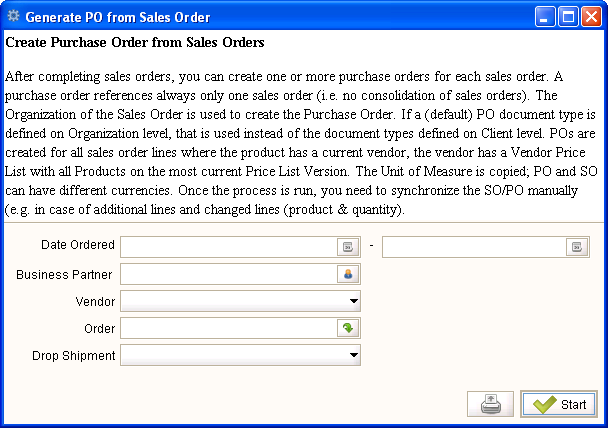 Help : After completing sales orders, you can create one or more purchase orders for each sales order. A purchase order references always only one sales order (i.e. no consolidation of sales orders). The Organization of the Sales Order is used to create the Purchase Order. If a (default) PO document type is defined on Organization level, that is used instead of the document types defined on Client level. POs are created for all sales order lines where the product has a current vendor, the vendor has a Vendor Price List with all Products on the most current Price List Version. The Unit of Measure is copied; PO and SO can have different currencies. Once the process is run, you need to synchronize the SO/PO manually (e.g. in case of additional lines and changed lines (product & quantity). This page was last modified on 14 December 2006, at 12:23.